Are you a local historian or do you just have some great information, pictures or stories about Skirlaugh? If you do, why not share them with the rest of the village by clicking here. Skirlaugh as we know it today was formerly known as North Skirlaugh and South Skirlaugh, the division between the two being the Lambwath stream. The western part of North Skirlaugh previously was in the parish of Swine, and it is thought that the stream which runs north - south, crossing Vicarage Lane to reach the Lambwath formed its boundary, The rest of North Skirlaugh was part of the ancient parishes of Long Riston and Rise. The name "Skirlaugh" is of Anglo-Scandinavian origin, and means "Bright clearing". In the late 18th century the dozen houses of North Skirlaugh were mainly along both sides of Rise Road, at its south end crossing the Lambeth into South Skirlaugh in what is now Church Lane. 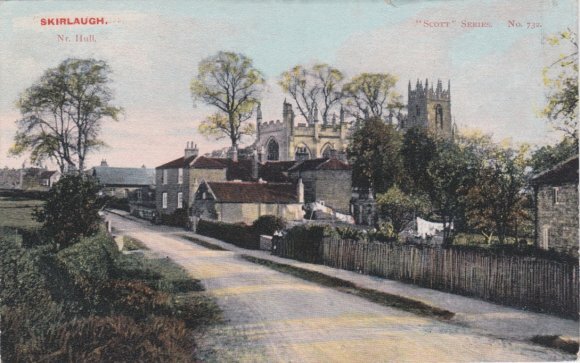 Vicarage Lane was a cul-de-sac, extended westwards before the mid 19th century to connect with the South Skirlaugh - Long Riston road. The older buildings to the north of the Lambwath include the listed Springfield House dating from the late 18th century, and Ivy Cottage, the Old Vicarage and Vicarage Row cottages, all from the 19th century. The Council Offices by the A165, also listed, were originally built c. 1840 as the Skirlaugh Union Workhouse, but were used as a Military Hospital during the First World War before being bought by the council in 1922, and have been used as Rural, Borough and Unitary Council offices to the present day. Much of the land was, from the early 17th century, owned by the Bethell family. There was a water mill which stood on the Lambwath close to the bridge (of the same name) over the A165. It is thought that it was also the site of the mediaeval Meaux Priory's fishery. There was a school from the 1830s which took a dozen boys and girls, paid for by their parents, though some girls were paid for by Mrs Bethell. South Skirlaugh was the larger part of the settlement. Although visually separate until the 20th century, the building of around 90 council houses by the rural district council and several private developments ensured that North and South Skirlaugh merged to become visually one community. In the late 18th century there were four licensed houses in South Skirlaugh, three of which survived until within living memory. There are now two, The Duke of York & The Sun. South Skirlaugh had a number of village institutions, including a Lodge of the United Ancient Order of Druids (from the mid 19th - 20th centuries), an annual Summer Feast in the late 19th century, a Reading Room and a Working Mens Institute (in the former Primitive Methodist Chapel), a Lending Library, and Youth Clubs. There were two cricket & two Football teams in the early 20th century, but the present playing field ofTBenningholme Lane was not provided until around 1970. Allotments have been provided on part of the land bought for a cemetery extension in 1975. The historic ownership of lands in South Skirlaugh was more diverse than in North Skirlaugh with various families being in possession of plots. There may have been a school in South Skirlaugh in the late 16th century, but its history is unsure, and it is not until the mid 18th century that we know that there was a Church School with around 20 pupils. A new National school was built in Benningholme Lane c.1860, where 49 were in attendance in 1871. Average attendance declined from 115 in 1906 to 59 in 1937-8. But by the 1960s the school needed additional accommodation and a new Church school was built next door which opened in 1968. Because of the closure of nearby schools the number taught rose to 268 by 1990. The former school buildings then became used as the Village Hall. South Skirlaugh has had two famous historical figures: Walter Skirlaw, Bishop of Durham (d.1403) and John Bigland (d.1832), who was first a schoolmaster and then a professional author, publish several books, mainly on geographical and historical topics. South Skirlaugh had a windmill, off Benningholme Lane, and corn was ground here until around 1910. It was demolished in 1944. St Augustine's Church was rebuilt by Walter Skirlaw, Bishop of Durham,in 1404 in the fashionable Perpendicular style and is a Grade 1 listed Building. 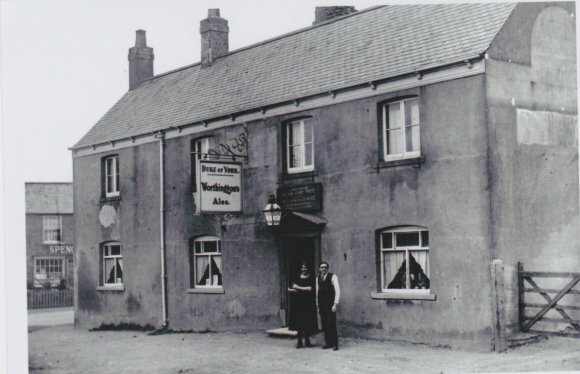 The village has always had a mixed economy, with up to 30 tradesmen in the early 20th century. It is however expected that these figures will show an increase in 2021, by which time the new Benningholme Lane development should be completed. Much of this information used was taken from the Victoria County History - East Yorkshire, Volume 7.